The staircase is not a good fit for the beach. The Planning Commission voted 4-0 July 19 to send the project back to staff, rejecting staff’s recommendation – which was endorsed by the Surfrider Foundation, California Coastal Commission and Department of State Parks – to move swiftly to construct the stairs to avoid a bluff-top collapse that could destroy the beach’s iconic switchback staircase and parking lot. Siding with residents who came out in force to oppose the proposal, the commissioners said the staff needed to gather more community input and find a solution that fits more with the natural setting of the beach. The commission also rejected staff’s assertion that the bluff’s collapse was imminent, and requested the city conduct a full environmental review, rather than seeking an emergency permit that would exempt the project from environmental review. “Either we are in imminent danger and trail should be fenced off, or it’s not, and it should be able to go through true (state environmental) process, so all residents get a chance to feel they have participated in a normal legal process,” Planning Commissioner Jody Hubbard said. 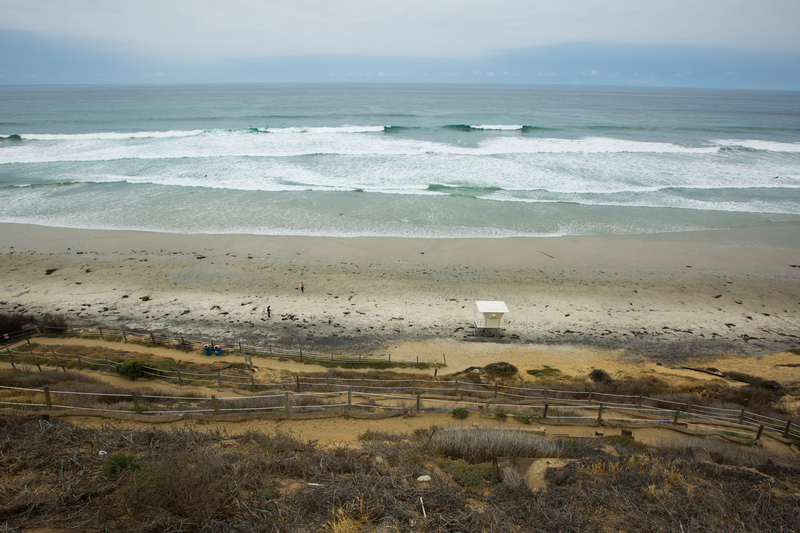 Encinitas has been grappling for nearly two decades with how to fix the unstable coastal bluff that threatens the switchback staircase and the parking lot atop the coastal bluff at the beach. The city originally pursued a seawall at the beach during the 2000s, but the state withdrew the grant in 2009, citing its policy against sea walls. After additional initial attempts failed to past muster with state agencies, city staff in 2017 emerged with a plan to relocate the parking lot further landward and build a new staircase to replace the iconic switchback staircase with one similar to ones at Grandview and Swami’s beaches. The City Council approved as part of its 2018-19 budget $4.15 million for the project – $750,000 for engineering and the balance for construction. City officials hope to break ground on the project by October. But a groundswell of opposition emerged in June, when the city unveiled the preliminary designs for the staircase, which featured concrete foundations and stairs, which residents felt would destroy the character and charm of the beach. A group called “Preserve Beacon’s” began a petition drive and collected more than 500 signatures of residents and surfers opposed to the project. But the city’s plans received the backing of the Surfrider Foundation, which said the city’s plans was the best compromise of maintaining beach access and keeping the public safe. Surfrider policy manager Julia Chunn-Heer likened the bluff’s instability to a Jenga tower, teetering on the brink of collapse. One by one, however, residents and a lawyer representing Leucadia coastal property owners disagreed with the assertion that the bluff’s collapse was imminent. Commissioner Kevin Doyle, who represents Old Encinitas on the panel, said that he favored delaying approval and taking a chance that weather and seismic conditions would hold long enough for more public input and a more thorough environmental process. It’s sad when years of effort and outreach and negotiation lead to a plan that staff and Coastal Commission can both accept (which wasn’t the case for many years), only to have it rejected by the PC. Nobody likes change, but nature changes whether we like it or not, so isn’t it better to make sure we have continued safe access? People go to the beach for the sand and the ocean, not for the staircase! Very sad. The community is really busy with life as opposed to closely monitoring what the city council is doing behind closed doors. Watch the Planning Comission Meeting in its entirety; it was at capacity with the entire Beacons Beach community who know this issue soundly rejected the Surfrider and the councils plan which delayed maintenance by 12 years! The residents and community were not able to be heard until the planning comission meeting. The City Council tried to bypass environmental review to specifically avoid public input. The CA coastal act is a balance between access and coastal preservation. This depressing maneuver by the City Council to bypass environmental review to ram their Surfrider Vegas Skywalk onto Beacons was illegal as was the plan to cut parking (i.e., access) by more than half. The Surfrider is obsessed with ‘managed retreat” whereby they lobby politicians and sue cities and property owners to prevent them from maintaining their property. They do this in the hope of creating a coastal collapse so they can claim the property for “nature”. There is no mention of managed retreat in the CA coastal act so I reject this idiotic idea as a driver for Beacons access and trail management. It would be like encouraging forest fires to burn down our town to return it it nature. Thus the Surfrider’s lobbyists and lawyer’s walked into Encinitas in 2006 and blocked all reasonable plans to maintain the trail AND the parking (i.e., critical access). The council worked exclusively with the Surfrider lobbyists on a illegal design that ruins access and then then tried to bypasses the community input and environmental review because of the “emergency”; even though 12 years have passed! Their plan is to let the parking lot fall into the ocean so we need a massive $4M steel and concrete staircase to withstand the collapse and provide access. Then they falsely claimed that the bluff was deteriorating at a very fast rate, that the sand at Beacons comes from the bluff, and that any rain erosion management device or plants would be a “de facto” seawall (even though the high tide line DOES NOT reach the bluff edge). All other logical, legal, and scientific ideas presented by the community were rejected because only the Surfrider knows for certain how much the sea level will rise and how that rise will effect everything. The process the City Council pushed was illegal, and many material facts were purposely misrepresented or omitted. If you watch the whole planning commission meeting it was 27 speakers to 1 calling BS on the Surfrider, their lobbyists and lawyers, the plan, City staff’s highly flawed analysis, and City Council’s attempt to blow off their constituents for special interests. This staircase concept needs to be scrapped and instead the trial needs to be protected and the parking preserved. Big props to the community for their great ideas and the Planning Comission for listening to reason.